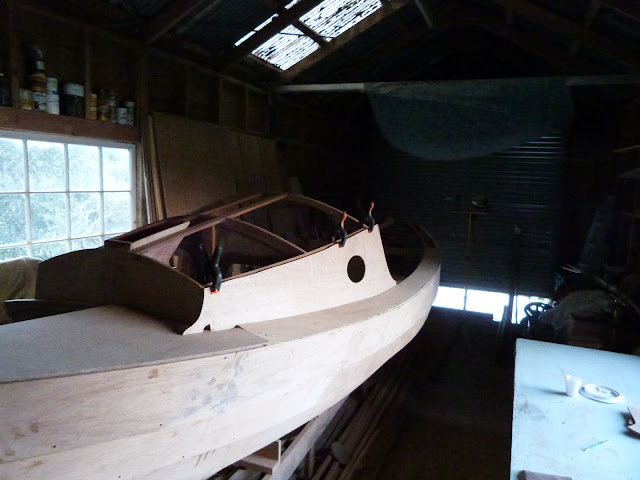 Boatbuilding is a good thing to do when its raining. Its springtime here, but spring here is usually changeable weather, the “all four seasons in one day “kind of changeable. It means that on average the air temperatures are climbing but there is so much rain that the ground is saturated, there is mud everywhere, its windy and that’s driven rain into places it does not normally get to, and the river is full of silt that’s overflowed the sediment ponds that the earthworks up stream where there is a lot of new construction going on. Ah well. It will come right given time. This morning was catchup with emails time, there are plenty left for tomorrow. How did we ever live without them? Life must have been so simple. I’ve had quite a lot of the day up there in the workshop though, after a major cleanup, sweeping out a heap of dust and shavings from when I shaped the offcenterboard, restacking some of the offcuts and clearing all the rubbish off the benches I cut out the starboard side seat top, glued the reinforcing doubler under the section where the access port will be, and faired the framing underneath. Having used jarrah hardwood as the ‘case packers, putting the angle on the top was a bit of a mission. The seat tops are angled slightly for comfort, when the ‘case was made with a square top, me figuring that it would be easy to run a plane along the top to get the angle right, I’d forgotten just how tough and hard Jarrah is. My angle grinder with 40 grit sandpaper just bounced off, the power plane was not much better, so it was sharpen the number 5 Stanley to a perfect edge and use lots of elbow grease to make it blunt again, several times! Memo to self, remember where the nails from the cordless nail gun are! Its done, didn’t take long, but gosh that stuff is tough. Next job was to work a little on the cockpit floor. I’d decided when drawing the boat to make a footwell at the after end as, this being a combination rowing and sailing boat, she’s a bit shallow in the body to provide the perfect seating position and still have the cockpit floor self draining. So, like Howard Rice has done with several SCAMPs including his own, I’ve put in a footwell with a liftout floor piece so, when needed, that can lift out and there is sufficient seat height to be really comfortable. The lift out section also gives access to the lowest point of the boats interior where the venturi bailers will be fitted, and where the pickup for the bilge pumps will be. Ok, done that, then the compass mount. I’m planning to do some reasonably serious voyaging in this little ship, so a good, accurate compass is needed. I managed to obtain a very good unit, second hand but still with its box, instruction manual and even a set of spare correction magnets. Long Steps will have a solar panel charging a big truck sized battery mounted up forward, that to power lighting both navigation and interior, vhf radio, GPS, sounder and such, and there will be quite a bit of electrical wiring, switches and so on up under the cuddy cabin roof, so that’s not a good spot for a magnetic compass. Sure, GPS will tell me which direction I’m headed in, but the magnetic compass will work even with complete failure of the electrics, plus its easier to steer by. Also, the distance between the helm and the forward end of the cockpit is such that it would require binoculars to read the compass when steering. Its about 2.5 metres, thats over 8 ft 6in for the metrically challenged, too far to read the figures on the compass card. That means that its going at the after end of the cockpit floor, the mounting lifts it up enough to be clearly visible from the helm position, or when rowing, and the mounting box is strong enough to act as a footbrace to stop me sliding around when the boats heeling a long way. It will also be part of the mounting for the rowing foot braces and hide the drains into the area where the two venturi bailers will be located. I much prefer having one thing do several jobs than have several things doing one function each! The removable section of the cockpit floor is clearly visible there, finger holes to drain water into the cavity as well as making it easy to lift out, there are locks to fit that will keep it in place until removal is needed. Note that the rest of the cockpit floor to the forward end of the seats covers the ballast tank which is about twice the size of that in a SCAMP. If I'm forced to right the boat out there at sea, I want all the help that I can design and build in, that plus I want the boat stable enough so it wont tip around so much when someone moves that my drink gets spilled. The compass mount is that box structure at the after end of the cockpit floor. Its just loose fitted as yet, will be sanded off and the interior of the box coated, the drains cut where it sits on the bottom against the bulkhead, and pieces fitted to the sides to take the rowing foot braces. Yes I know that the competition rowers call them "stretchers" but this is not a competition rowing boat so I can call them whatever I like. Incidentally, that reddish wood you can see on the starboard side seat front is the jarrah offcentercase packer I was wittering on about. 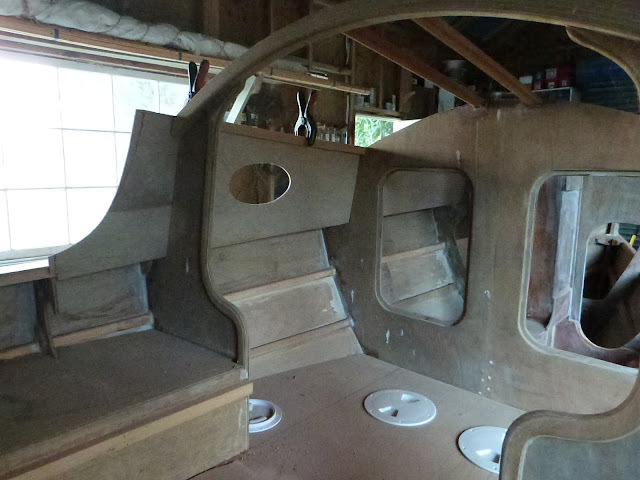 A couple of days ago I cut out one side of the cabin, the foredeck and the side decks for the port side. They’re just sitting there loose at the moment but do give a flavour of progress, making the ship look more complete. The fore and side deck pieces loose fitted, and the "cabin" side piece sitting held by a couple of spring clamps, I like making ellipses, two nails, a piece of string and a pencil, fun but I promise I'll draw the shape full size on the plans. The cabin side from inside, yes, I've been in there and sat for a few minutes. 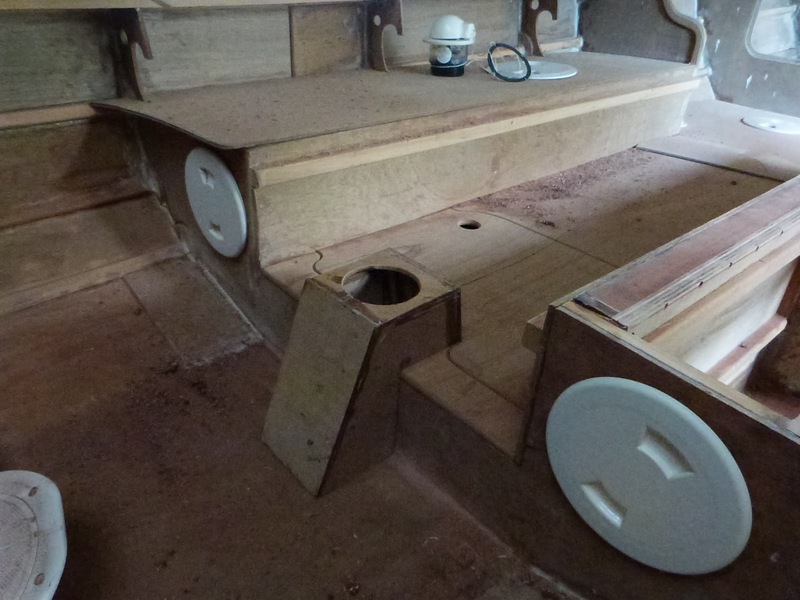 There will be a little side locker below the side deck edge which will form a backrest to make it more comfortable. I’ve drawing work to catch up on, so no more boatbuilding for a few days, but its nice to go up into the shed for a few minutes now and again, lean on the gunwale and dream a little.